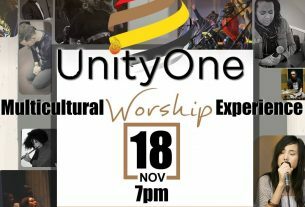 Unity One has opened up many doors for pastors, church member, and those in the body whose calling is multiethnic and multicultural worship to come together as a network of believers who seek to educate and empower the body of Christ with Biblical understanding on multicultural worship. Part of this is working with each other to creates further dialogue on the subject of multicultural worship. Kimberly Holmes, Visionary & Founder of Unity One, lent her typing-voice as a guest blogger for Redemption Boulevard, a multicultural training ministry. You can read the blog post directly by clicking here. In the spirit of unity, spend some additional time reading the other posts at Redemption Boulevard. They offer excellent insights into everyday triumphs and challenges that come with enabling your church or ministry to work from a multicultural perspective when it comes to music ministry. Also, Unity One is preparing for their next worship concert experience on March 19th, 2011. Many people have asked how they can be involved. If that’s you, simply got o the Be Involved link, fill in your information, and the Unity One contact team will be in touch with you about how you can be involved with the next worship concert experience. Many blessings to you in this New Year!